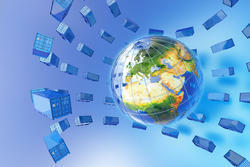 InGet-In was come into existence with a sole aim to garner maximum satisfaction to the clients. We were established in the year 2004 as a partnership owned organization and is involved in manufacturing, exporting, supplying, wholesaling, buyer company, buying house, service providing, retailing and trading a wide assortment of Kitchen Container, Office Container, Shipping Container and many more. By making use of quality assured raw material and advanced production methodology, we have been able to rise up with innovative product range in the industry. The material used in our products’ development is sourced from the most trustworthy and authorized market vendors, whom we have chosen after conducting detailed surveys of the industry. Being a quality focused organization; we are committed towards offering only better quality range into the market, which are best in terms of reliability and durability. We also provide various options to our clients to make payment that make monetary transaction hassle free and convenient. Due to above such mentioned factors, our company is successfully achieving its target up to 50 to 100 crore per year. Working under the prudent guidelines of our commendable business managing partner Mr. Sakthivel R., our company has successfully establish an outstanding position in the industry. He enables us to acquire huge support of clients with his rich industrial experience, visual approach and outstanding managerial qualities. We have established sophisticated infrastructure, which helps us in executing systematic operations and meeting the bulk as well as appropriate requirements of clients’ on-time. Our infrastructure encompasses several departments, which includes designing, production, quality control, sales and marketing, warehousing and packaging, research and development, logistics, administrative and several others. All these departments are well-equipped and to manage their operations efficiently, we have hired a team of specialized professionals. Our company possesses a highly skilled, qualified and experienced team of professionals that perform towards an aim of achieving set company’s targets successfully. We have hired our team after checking their talent, skills and abilities on various parameters, thus we assure our clients to deliver these products after testing their quality. Furthermore, our team encompasses designers, production personnel, warehousing and packaging experts, quality controllers, logistics experts, sales and marketing personnel, procurement personnel and many others. We supply used/second hand shipping containers of 20 GP/40 GP/40 HC and any other type/size, as per your requirements, around the world. we also supply new shipping containers of all types/sizes, at CIF basis to your location/s, across the globe. we are the manufacturers of modified/customised/office/storage/cabin/housing containers as per your specifications and design. 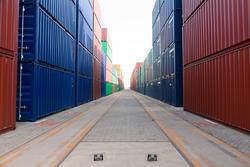 we provide depot services like storage and repairs for all types of shipping containers in India. 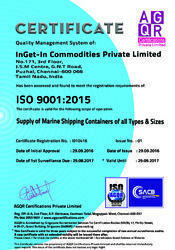 All the shipping containers supplied by InGet-In, are manufactured in ISO standards with DNV certified and having valid CSC plates for international transportation around the world. (3) "WIND and WATER TIGHT" (WWT). 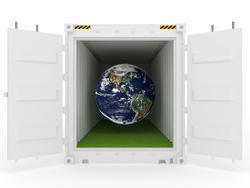 Domesticated (Duty Paid) CONTAINERS are also available for storage & other domestic use in India. These units are Customs Duty paid and are supplied with Bill of Entry duly certified by Customs. Highly sophisticated communications set-up supports us to give you the up to date information with prompt replies and updates. Sales Leads are handled with systematic reply mechanism with pre-determined professional customer response system by dedicated staff. We are now CERTIFIED as ISO 9001:2015 Company. 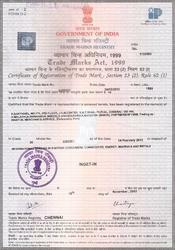 "InGet-In" is a Registered TRADE MARK, under Trade Marks Act, 1999, issued by Government of India. Trade Mark No. : 2289201 dated 24-Feb-2012. Mr. Anandababu Dorairaj, our FOUNDER, the FORCE and POWER behind OUR Aim, Belief, Core Values, Future Plans, Goals, Milestones, Mission, Motto, Philosophy, Values, Vision, Principles and of course our Business Ethics. 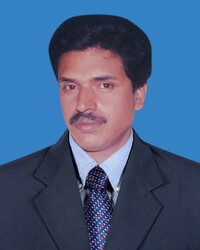 Mr. Sakthivel R, a Finance Professional with wider experience in all aspects of accounting, auditing, Company formation, International Taxation, International Trade Management, export/import documentation, international Forex transactions and financial management. b) Import and Export of Commodities, Metals and Minerals. c) Consultancy Services for Business & Financial strategies. 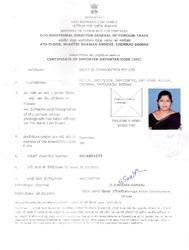 IMPORTER-EXPORTER CODE, issued by DGFT under Ministry of Commerce, Govt. of India. We are associated with a well managed Logistics Companies through whom we arrange to DELIVER the CONTAINERS to your stipulated site, at actuals. This is mainly aims to simplify your purchases by which you will get the CONTAINERS at your site by a single TRANSACTION. Textainer Equipment Management Limited, U.S.A.
Triton International Container Limited, U.S.A.
We buy their SALE UNITS directly from them in USD (US Dollars) and supply to all our present and prospective CUSTOMERS. 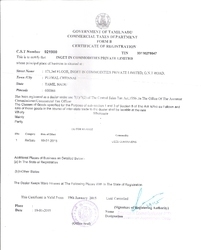 TIN and CST Registration Certificate, issued by Commercial Taxes Department, Govt. of Tamil Nadu. EDUCATE customers on LEGAL formalities & be TRANSPARENT. Prompt and detailed reply to all sales Enquiries. Timely follow up and STATUS updates. EDUCATING customers with LEGAL FORMALITIES of Customs and Tax related matters of our Products. Complete pre-sales and post sales SUPPORT with care and concern. InGet-In has achieved respectable position of being a PROMINENT SUPPLIER in this industry, due to OUR ability of providing reliable and desirable solutions to the clients, mostly CORPORATE EXPORTERS and MULTI Natinal INFRASTRUCTURE Companies. 1) Exporters, where they require SOC (Shipper Owned Containers) to EXPORT with their CARGO. 3) Manufacturing Companies for STORAGE of Raw Materials & Finished Products. And our Own Brand "IGIU" & "IGNU". 1) By RTGS / NEFT / IMPS through BANK. 2) By Demand draft (DD) or Banker''''s Cheque / Pay Order. 5) By Direct Deposit in our Bank account. • GST: 18% on Invoice Value. 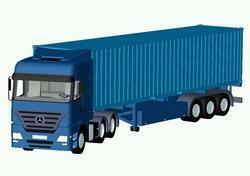 • Transportation to your site is extra and will be arranged/ quoted, upon your request with delivery site address. • Once the rates are confirmed, we will provide you the unit numbers for survey. • You may arrange for a survey by your own staff. After Survey & selection of Containers and upon your confirmation on the same by mail, we will proceed with the invoicing process. • After the invoicing process, 100% payment to be made by RTGS/NEFT and then we will proceed with the domestication process. • Delivery order will be issued for the pickup of the container after the completion of inspection by the Customs within 5 to 7 customs working days from the date of payment. • Domestication document (Bill Of Entry) will be couriered to you within 15 working days. • The quote is valid for 5 working days only.